WASHINGTON (CNN) -- Five Cubans convicted in 2001 of spying for the Castro regime had their appeal tossed out Monday by the Supreme Court. 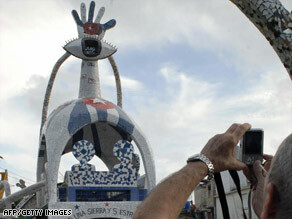 A man takes a picture in September of a sculpture in honor of the Cuban Five in Havana, Cuba. The men had sought a new trial in a politically charged case that has attracted international attention. Lawyers for the "Cuban Five" said their trial in Miami was unfairly prejudiced by the larger community. The justices without comment denied the request, leaving the convictions in place. Cuban leader Raul Castro has offered to exchange about 200 prisoners, believed by the United States to be political prisoners, for the five men. Lawyers for the men in their high court appeal said justice was not served in the original prosecution. "The pervasive and violent anti-Castro struggle of the Miami community would not only infect the jury with hostility but would cause jurors to fear for their (and their families') safety, livelihoods, and community standing if they acquitted," the lawyers said. The government opposed the request for the high court to take up the matter. A Miami jury in 2001 convicted members of what was called the Wasp Network on charges they had spied on prominent Cuban-American exile leaders and U.S. military bases. The five -- Ruben Campa, also known as Fernando Gonzalez; Rene Gonzalez; Gerardo Hernandez; Luis Medina (also known as Ramon Labanino); and Antonio Guerrero -- were arrested in September 1998. Hernandez, the group leader, also was convicted of conspiracy to commit murder for engineering the shoot-down in 1996 of two planes flown by the group Brothers to the Rescue. Cuban fighter jets downed the unarmed Cessnas as they flew toward the island, where they had previously dropped anti-government leaflets. Four men died. During the trial, the defendants claimed they had spied as a way to defend Cuba from hard-line anti-Castro groups in Miami they feared would attack the island. All five are serving time in federal prisons. The case has been widely followed in Cuba, where the men were regarded as heroes and whose communist leader, Fidel Castro, regularly advocated their release. A federal appeals court had originally thrown out the convictions, but later reinstated them. Attorney Thomas Goldstein, representing the five, argued lower courts unfairly refused to move the trial from Miami to Fort Lauderdale, 30 miles to the north. "The defendants were very concerned about the prevalent anti-Castro hostility, and the tremendous press coverage," he said, "The [federal] appeals court has made it virtually impossible to get a change of venue, even in this kind of case." The appeal also claimed prosecutors unfairly excused seven potential African-Americans from the pool of potential jurors. The final jury included three black members but no Cuban-Americans. The Cuban Five trial was the only judicial proceeding in U.S. history condemned by the U.N. Human Rights Commission. Eight Nobel Prize winners had also petitioned the U.S. attorney general, calling for freedom for the five. The Supreme Court also rejected for now a look at the legality of a 700-mile fence along the Mexican border, an ongoing state-federal dispute triggered by the politically sensitive issue of illegal immigration. The justices without comment Monday refused to hear an appeal from officials in El Paso, Texas, and a coalition of private groups who are upset at a 2005 federal law authorizing the "secure fence" along key corridors of the southwest border. The structure is nearing completion. At issue is whether the homeland security secretary has unilateral authority to "waive all legal requirements" necessary to ensure rapid construction of the barrier, without an opportunity for judicial review. That power to bypass any environmental and state regulations prompted a number of lawsuits by local governments and advocacy groups.